Since their discovery more than a decade ago, induced pluripotent stem cells (iPSCs) have become an invaluable tool, both in fundamental cell biology and in more applied areas such as regenerative medicine. The awarding of the Nobel Prize in medicine in 2012 for their discovery clearly underlined the immediate impact iPSCs had across a range of scientific disciplines. 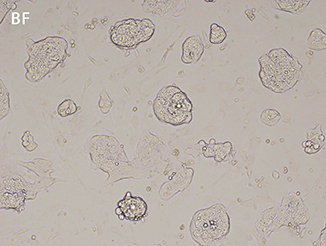 Many applications for iPSCs require the same processes as those used for growing other adherent cell types – seeding, 2D culture, suspending, counting and subculture – until the population is large enough for differentiation and/or analysis. However, the effect that culture conditions have on the growth and behaviour of iPSCs is much greater than with many terminally differentiated cell types. 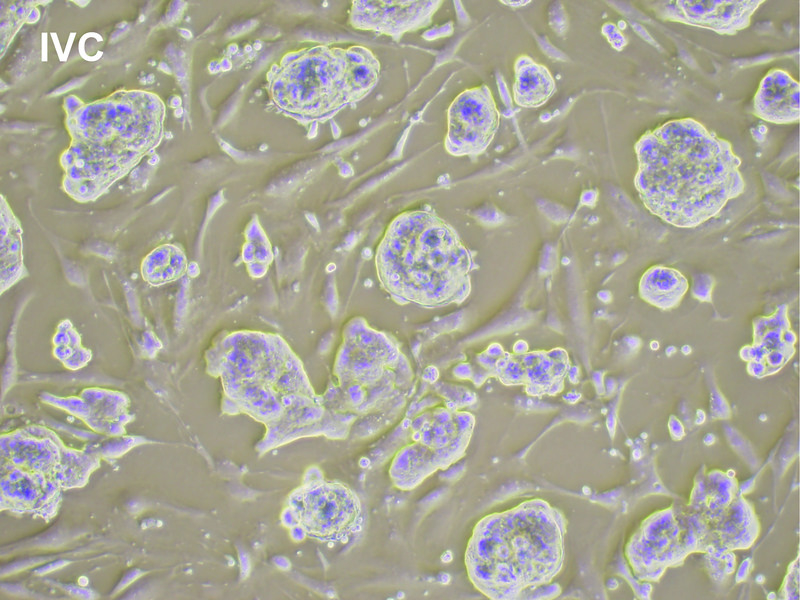 Understanding and culturing iPSCs requires optimal use of the tools available to the researcher. Here, we examine some of the tools developed to help researchers improve and facilitate their research into iPSCs. When comparing the culture of pluripotent stem cells to other cells, the main aspect in every researcher’s mind is consistency. iPSCs form a potentially unlimited, uniform source of pluripotent cells, but this means that cells need to retain their phenotype during weeks – or even months – of culture and subculture. Many factors can affect the phenotype of iPSCs during this growth phase; these factors include growth medium, seeding density, confluency and even temperature fluctuations. Ensuring consistency in all these parameters requires detailed protocols and experience in cell handling. However, the use of high-quality equipment, software and optics also plays a pivotal role in accurate, consistent culture of iPSCs. Seeding density determines the growth rate of cells and therefore the number of subcultures needed to reach the required population. This is normally determined by counting suspended cells from a fixed sample of medium (typically between 10 and 100 µL). However, when counting cells manually, it can be difficult to distinguish individual cells within colonies. 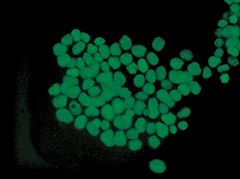 In cell suspensions containing clumps it is often impossible to accurately count the number of cells in a single clump, which can lead to counting variability. 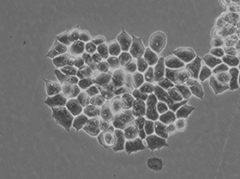 When using automated cell counters, it is possible to use liquid lens autofocusing and specialised software algorithms to improve cell counts (Fig.1). 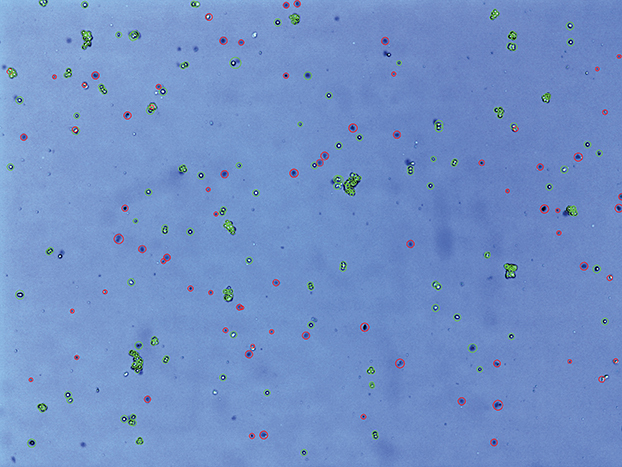 Liquid lens autofocusing helps to distinguish and count individual cells within cell clumps. This feature, together with specialised counting algorithms, helps to improve speed and reliability by counting an area five times larger than a haemocytometer in around 15 seconds. Unlike most adherent cells, pluripotent cells are often subcultured as colonies instead of single cells due to their poor tolerance to individualisation. Confluency of the colonies before and after subculture greatly influences cell signalling and therefore the quality of an iPSC population. Confluency of iPSC colonies, however, can be difficult to assess by eye – particularly when grown on a layer of feeder cells. Researchers can easily corroborate their observations at the microscope with the help of confluency-checking software. Intelligent software can quickly collect multiple images and distinguish colonies from the background in a reproducible manner (Fig.2). These images can then be quantified and exported to a PC, laptop or tablet for fast decision-making and easy archiving. Whether iPSCs are analysed by eye at the microscope or electronically using image analysis software, quality optics matter. In low-light imaging modes, such as fluorescence and bioluminescence, capturing and using the available light as efficiently as possible is key to carrying out analyses and producing publication-quality images. To obtain images with a better signal-to-noise ratio in low light, it is important to use high-quality objective lenses with a high numerical aperture (NA), as shown in Fig.3. 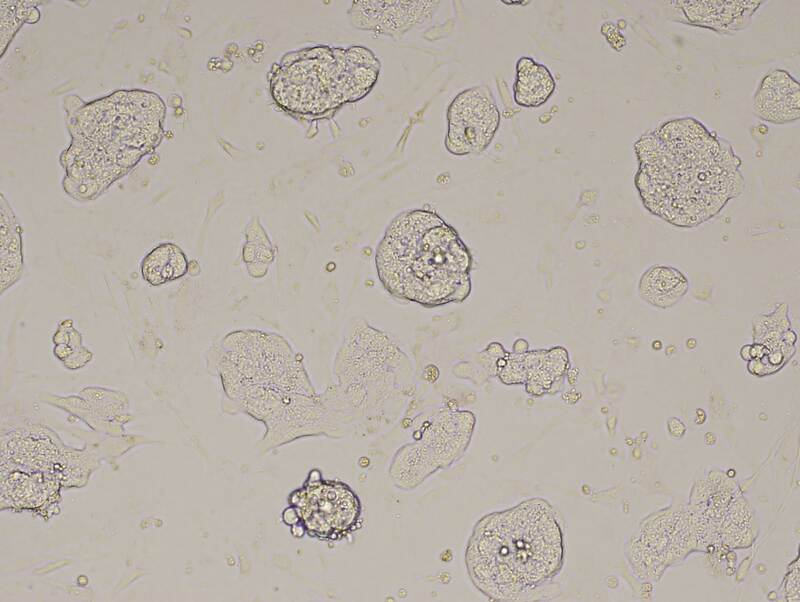 High-NA lenses enable researchers to observe stem cells more clearly in the plastic-bottomed vessels commonly used in cell culture. This means that researchers no longer need to use dedicated glass-bottomed vessels for checking and documenting cell growth. Another way to improve the clarity and quality of images is by applying advanced contrast methods, such as inversion contrast (IVC). 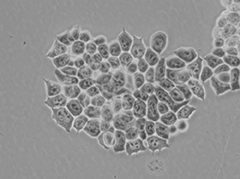 IVC addresses some of the drawbacks of phase contrast, such as halos forming around cells. When iPSC colonies grow on top of a feeder layer, the effect of IVC is even more striking due the difference in morphology between the colonies of iPSCs and the monolayer of feeder cells (Fig.4). 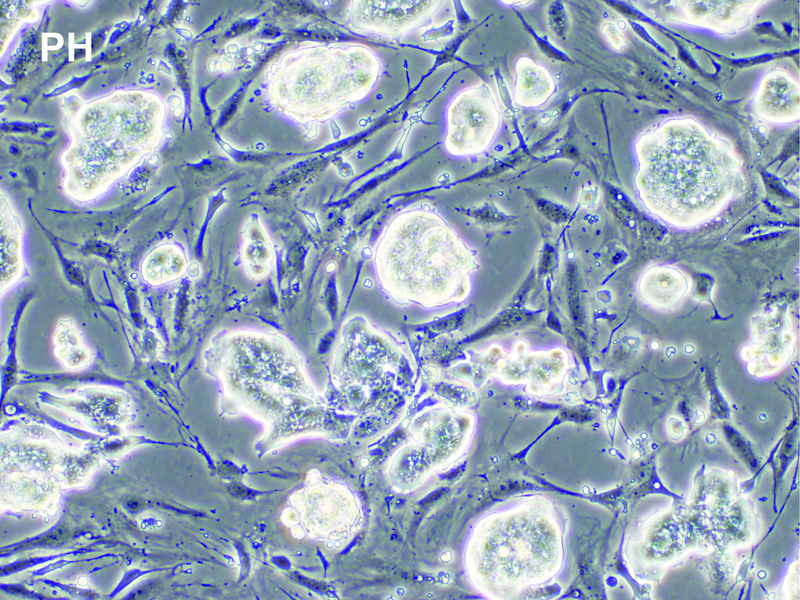 In just over a decade, iPSCs have become a recognised and respected tool in life science research. To harness the potential of iPSCs in new scientific discoveries, the importance of consistent culture conditions and accurate observations and measurements cannot be overestimated. With a combination of the latest technology, software and optics, researchers can get the most out of their iPSCs by ensuring accuracy and consistency of results.